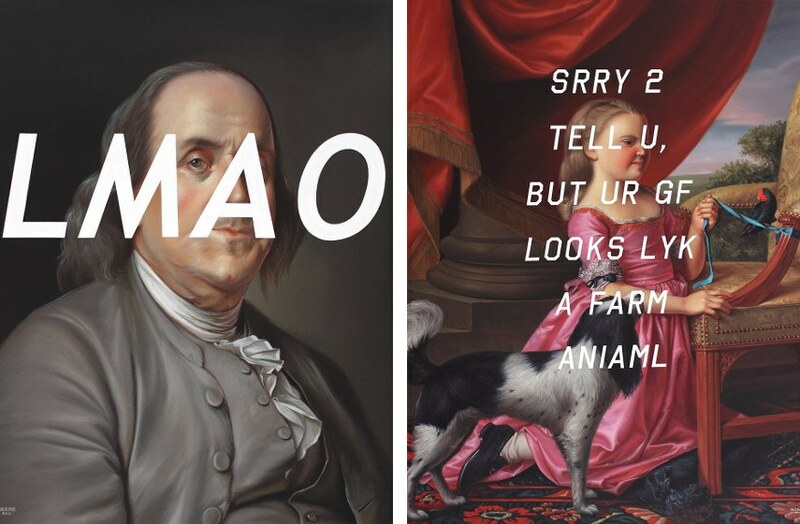 Shawn Huckins past incarnation was probably somewhere in the 18th century and American revolution period. He grew up in New England, and since he was young he was surrounded by the architecture of that period. Nostalgically reminiscing the past and assuming that people were closer at that time, Huckins paints incredible acrylic paintings with scenery from American history. 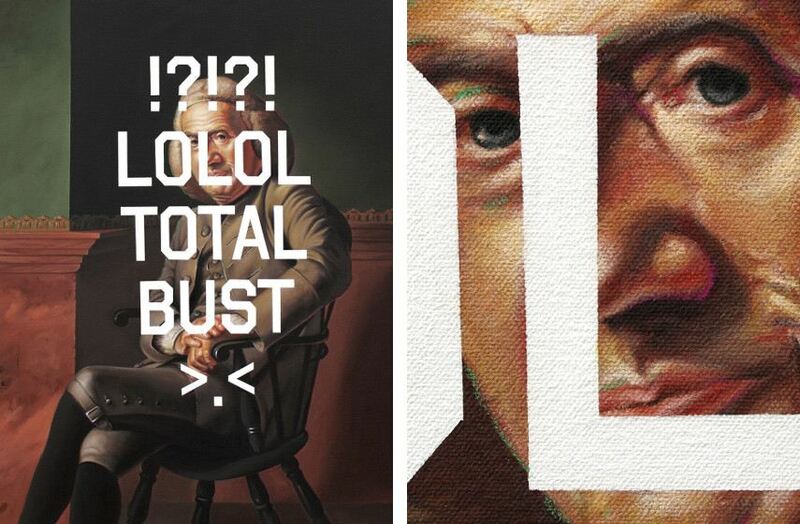 He combines old classics with contemporary internet slang, so he could unite old and present through language. Behind the language game, there is a satirical message he’s sending. With every revolution comes a collateral damage, but in the case of the internet revolution and modern technology, there are not only older generations that are not finding the transition easy, there are also our communication skills that have a hard time getting by. Shawn started drawing when he was a child and had a hard time with oil painting. He only returned to painting later in high school and at college. When Shawn discovered acrylics his talent finally got the opportunity to shine. It happens quite a lot that viewers think his paintings are photoshopped or digitally printed. Going into details with amazing dedication, Huckins protects the text area with tape, so the letters could shine, and gets the end product that’s both funny and thought-provoking. Are we really that lazy that we communicate using abbreviations? Are LOLs funnier than real laughter? Do we have time to sit and listen, to thoroughly go through the subject of interest or is everything tl;dr (too long, didn’t read). The American Revolution Revolution is a series of portraits with new revolutionary technology slang, with an underlining message of alienations and miscommunication that are taking their tool. The paintings are supposed to be funny, to be silly and to make the audience giggle. In his artist’s statement Huckins openly says that new technology revolution doesn’t scare him, but it’s not something he would let go out of control. Using smartphones, snapchats, Instagram and tweets, we are used to economizing, to pack our thoughts in short forms. There is no time, either free time or time to stop and smell the roses. When sending a text there is no need to correct grammar or typos, we all understand it perfectly well. So, he wonders what is the next step, how are we to change the fact that we don’t communicate well. 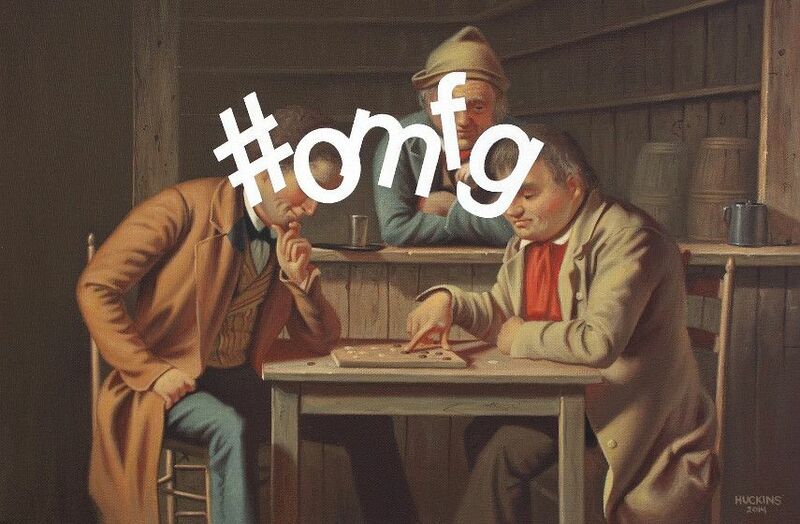 Shawn Huckins has an answer to language mess we are in. We all need more humor and more fun. There is no need to incorporate dark and deep emotions into everything, and sometimes the best victories can be achieved while fighting on the sunnier side. In the second series of bold white text on top of the American 19th-century sights, called The American __tier the artist again uses irony and humor to mourn for better days. Even there is no certain guarantee that people were bonding easily, that relationships were tighter and more honest, we can assume that there were no silly distractions, there were longer attention spans, better sleep cycles and more honesty. It is very important for Huckins that he paints everything, in his hands lays the honesty, the true effort and identity. It is not copy/paste art. The artist is respresented by Stephanie Chefas Projects in Portland, OR, Goodwin Fine Art, Denver, CO and Modernism Inc, San Francisco, CA. 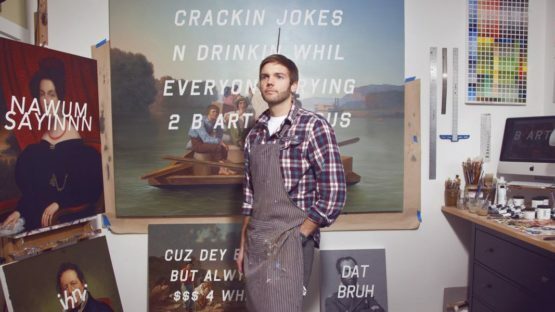 Shawn Huckins lives and works Denver, Colorado.